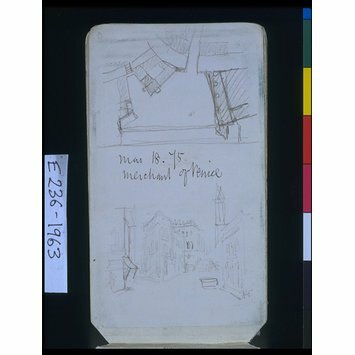 Sketchbook containing studies of costume from works by Vecellio, Jost Amman and others and designs for stage settings for a production of Shakespeare's 'The Merchant of Venice'. There are also studies of costume etc. copied from manuscripts in the British Museum and from the Bayeaux Tapestry for Shakespeare's 'Macbeth'. On p.59 is a portrait of William Burgess dated 25 June 1875. 76 pages (others missing) of metallic surfaced paper, thread-stitched in paper boards. Inscribed throughout with notes, comments on plays, including a production of 'Macbeth' at the Lyceum Theatre, 5 October 1875, a description of some painted panels of the legend of Amor and Psyche, names and addresses etc. Most of the costume studies in this sketchbook were reproduced as illustrations to an article by Godwin on ‘The Costume of The Merchant of Venice’ on p.74 of Vol.13 of The British Architect, January to June 1880, where it is stated that ‘the illustrations given this week are taken from pencil sketches in my note-books, made chiefly in 1874-5, added to an tested a few weeks since’. Other studies for the costume etc. of this play are in the sketchbook E.250-1963. The article suggests that the costumes would be equally suitable for Othello and they may have been used in Mrs. Bateman’s production of that play, first performed at the New Sadler’s Wells Theatre, 20 September 1880. One costume on p.17 was reproduced with others for Othello on a plate following p.176 of Vol.14 of The British Architect, July to December 1880. Mrs. Bancroft’s production of Shakespeare’s The Merchant of Venice was first performed at the Prince of Wales Theatre, London, 17 April 1875, with Ellen Terry as Portia. 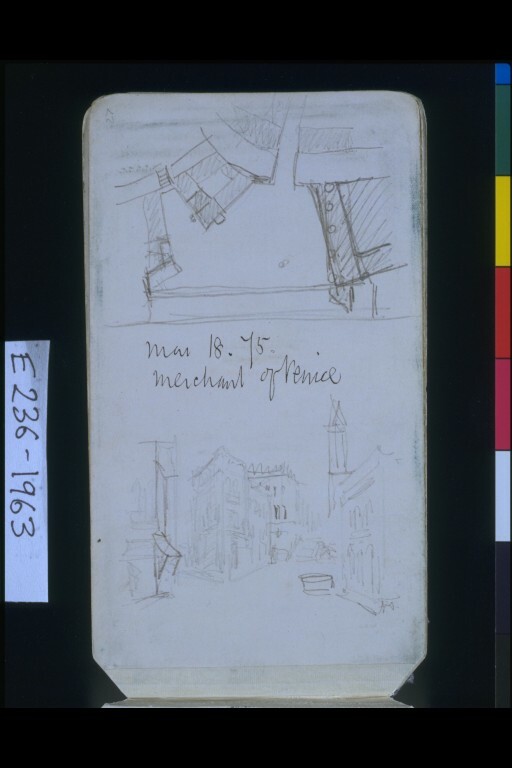 Sketchbook containing studies of costume from works by Vecellio, Jost Amman and others, and designs for stage settings for Mrs. Bancroft's production of Shakespeare's 'The Merchant of Venice', along with studies of costume etc. copied from manuscripts in the British Museum and from the Bayeaux Tapestry for Shakespeare's 'Macbeth'. On page 59 is a portrait of William Burges dated 25 June 1875. 76 pages (others missing) of metallic surfaced paper, thread-stitched in paper boards. 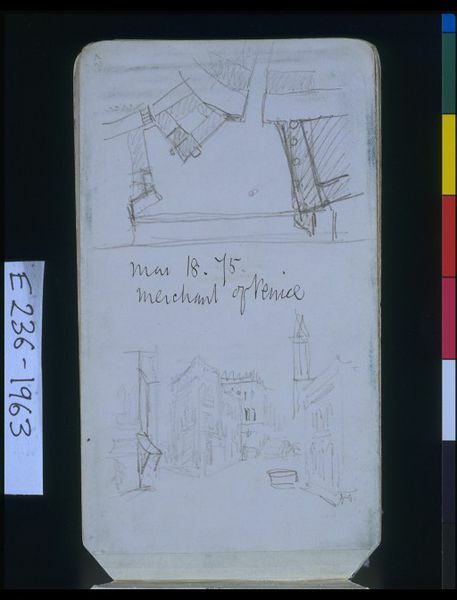 Pen and ink, metal-point and some water-colour drawings by Edward William Godwin, 1875.